Once I was walking with my friends returning to my home from my university. We were talking about some horror movies and there arose some difference in our opinion about a movie. I had the bad habit of using the mobile phone while walking on the street then. And I said to my friends, “Ok, Google it.” Suddenly my phone beeped and a window opened automatically and asked me how it could help me. It was the first time for me, so I was thinking about what I should ask. Also, I was surprised thinking which application was interacting with me. I saw it was suggesting me to ask what it could do. So I asked that. And it gave me a list of what it could do for me. In the beginning, I thought nothing would be very effective than Microsoft’s Cortana which was released April 2, 2014. Cortana comes with Microsoft launcher application which was debut on October 2015 for androids. On the other hand, as the apple users opinion, it is needless to say that the Apple Siri is outstanding. But if you ask about Google Assistant, Google Assistant changed my thoughts. The era of machine learning seems like to be found in wormholes. I got inside and went into the future where the world has just been developed in machine learning technology, the rule of technology with circuits, battery, chips rather than blood meat. 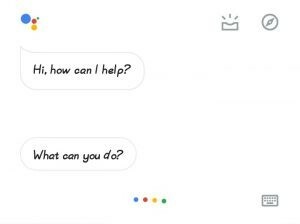 Google Assistant is a virtual assistant controlled by Artificial Intelligence, which is the biggest gift for Google Tech lovers. Google Assistant is primarily providing services through mobile and smart home devices. Unlike Google Now, Google Assistant can take part in two-way conversations. 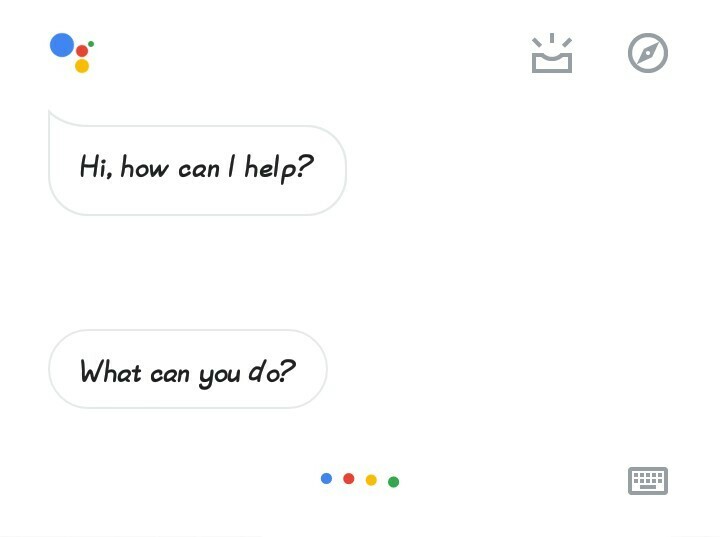 In the picture, you can see some funny two-way conversation with Google Assistant. 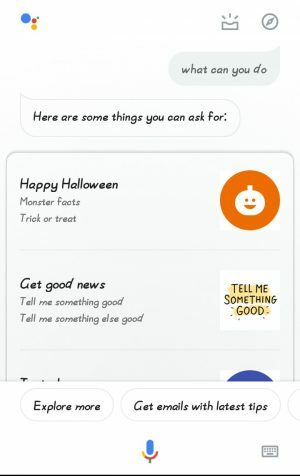 Users initially communicate with Google Assistant through the natural voice command, although keyboard input is also supported. You can also activate the application by saying “Ok Google” on the Android phone or entering into the app directly. 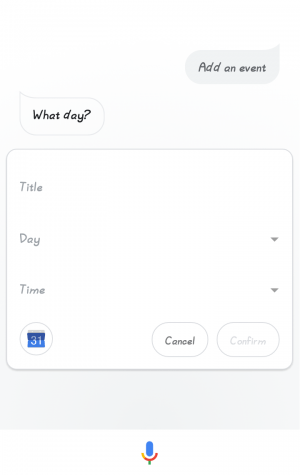 By pressing the keyboard, you can tell about your scheduled and you can do by voice command also. 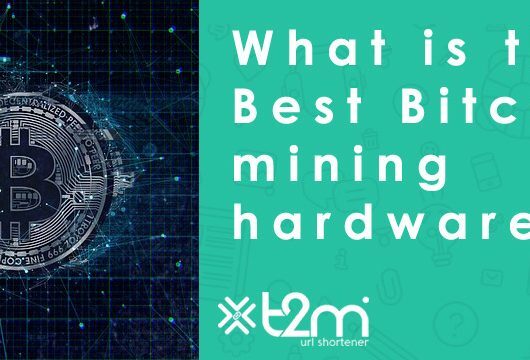 With the same nature as Google Now and in the same way, this technology is able to set the alarm, internet search, events, and adjusting hardware settings on users devices, and displaying information from users own Google accounts. Google has also announced that through this assistant, it will be able to identify helpful objects and collect visual information through the device’s camera, and will support the purchase of goods and money, as well as identify the favorite songs. 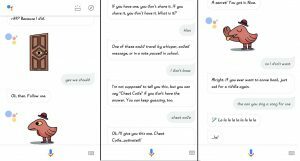 As part of the release of the Google Home Smart Speaker and the new Google messaging app Allo, Google Assistant was uncovered during the Google Developers Conference on May 18, 2016. Google CEO Sundar Pichai explained that the assistant was designed to have interactive and bi-way experience and extended across the device and an ambient experience. The full use of Google Assistant cannot be written down all. It depends on how smart you are. And on my own device, I checked that Google Assistant Response Time is faster than Microsoft’s Cortana & Apple’s Siri. So Google allows the Assistant to cross the rest of his life as a virtual partner of a person rather than Siri, and if you have a Google home system in your home then there is no doubt that you are staying in the future. Anyway, know about some interesting uses. You can tell your Google assistant to count from 1 to 10 or 10 to 1. You have to say “count from 1 to 10” or “count 10 to 1”. You can choose a different number than 1 or 10 too. But not larger than 100. There are numerous ways to find the current weather in the area where you live. But how will you know about the weather next week? Or next week, how will the weather in the rest of the world? If you have a lot of questions about weather, you can search through Google Assistant for a complete search for each. Just start talking with Google Assistant frequently as you talk with humans. For example, you can ask, “Will it rain tomorrow?” Even after getting the answers you can ask more questions. If you have planned a trip, you can also know the weather of the day you are going. 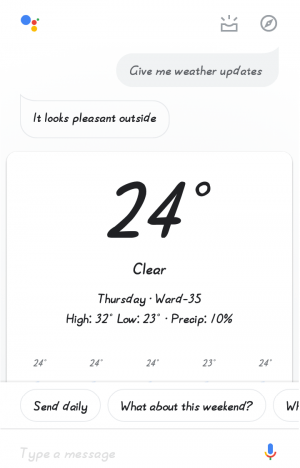 Even if there is a hostile weather on that day, Google Assistant will keep you informed in advance. Like yesterday afternoon I had to go to the campus, but Google Assistant asked me to keep with the umbrella. So really, the umbrella seemed to work quite well. The first benefit for the students or the employers lies in the same. This requirement is also appreciated in corporate life. First of all, you have a lot of apps on the phone, just install all of them. And if your phone is a Google Pixel series device then it will be all there as a built-in. 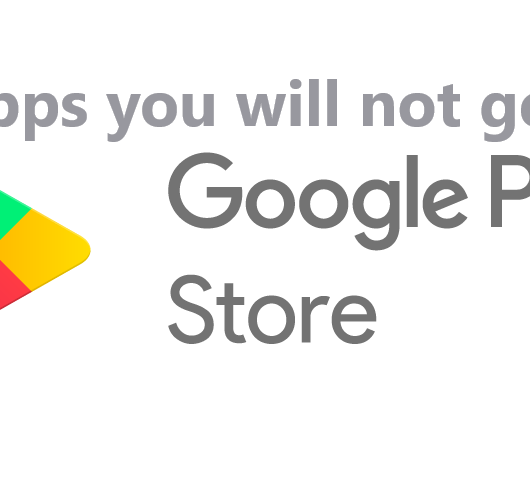 And if you are using the iPhone, then you must download Google Calendar or any other required app from the App Store, otherwise, the date set will not be marked on the iPhone calendar. It’s normal for Google Assistant to use Google’s product. You can save many events on the same day. Before the time, you can ask your assistant if there is in any meeting in front. It will tell you everything. You can easily find out a photo with the help of Google Assistant from your smartphone. It is able to read barcodes, identify faces and even identify the landmarks of the pictures you have sent. In this case, the photos will have to be stored in Google Photos. You can uninstall the various barcode scanners you are using, no problem. Send photos to Google Assistant, it is fast and efficient in identifying products and different things. For example, there are thousands of photos on my phone. But right now I want to see my cycle riding distance map screenshot on an emergency basis. 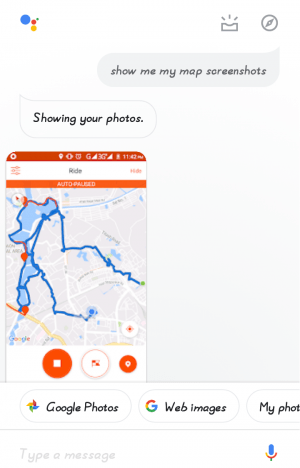 I asked my Google Assistant to show me map screenshots and it came with the result in seconds. Want to play your favorite song? Which songs you listen to most, your Google Assistant has already picked up that to your favorites list. Say it to play your favorite song that you want to listen to. Tuck the headphones in your ears. You can visit a website with the help of your Google Assistant. 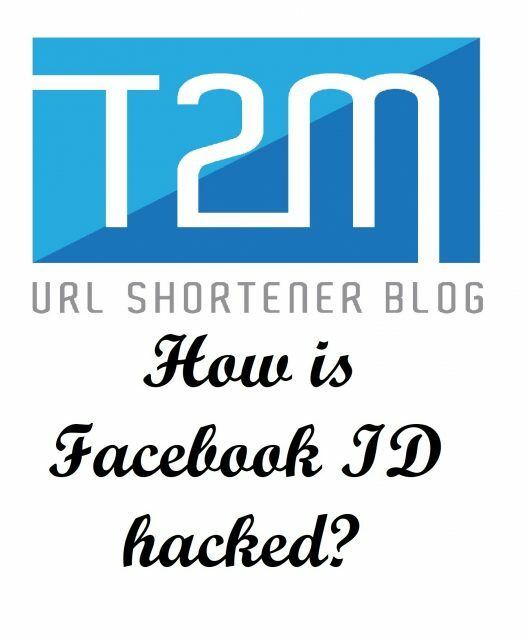 Like if I want to visit t2mio.com for URL shortening purpose, I have to say or type “go to t2mio.com”. And it will work according. 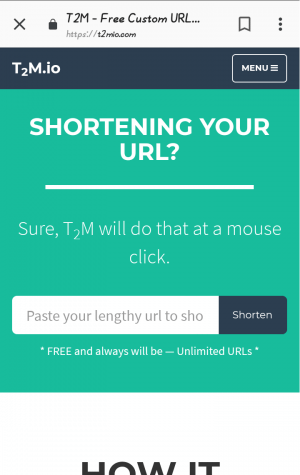 Then you will be taken to use URL Shortener t2m.io from Google Assistant app browser. Not the end, but now that you have done a lot of useful work with Google Assistant while reading this article I guess. So if you want to play games for a while with the app for refreshment, it’s not bad to spend leisure time! 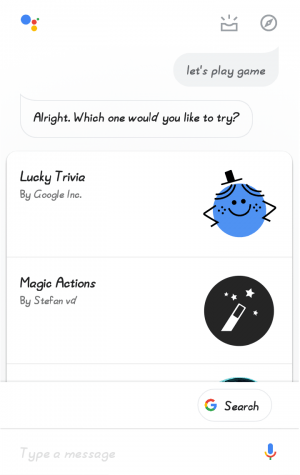 Just tell your Google Assistant that you want to play a game. It has managed to provide classic games like solitaire, Google doodles, quiz, and chat-based games. More about Google Assistant can be written, yet it does not end how much it needs. You are no longer alone. Look at your smartphone. The whole world is roaming around. Google Assistant is where the guide.